Electronic Kit School. - When you work with microcontroller now, we think you should concern to provide precision power supply unit that can make this microcontroller work properly and suit with our project. 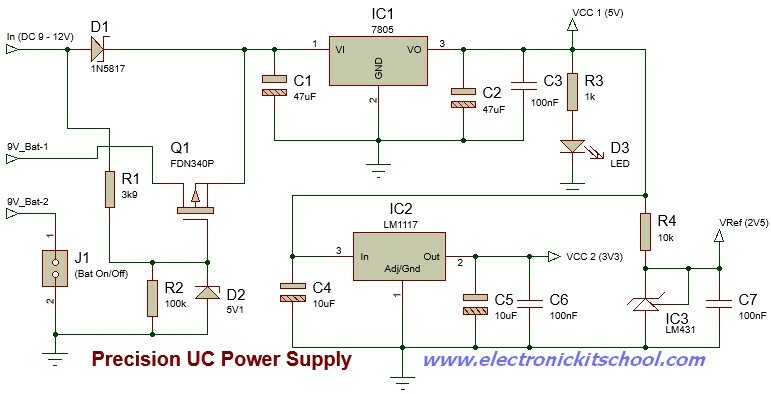 In this article we will show you one electronic circuit that will give you precision microcontroller power supply unit with three output voltage is resulted these are +5VDC, +3.3VDC and +2.5VDC. This circuit will implement to your project based on microcontroller that widely used in this time. According the Electroschematic site that also published this circuit show us that since an input switching circuit is added for internal/external dc power supply selection, you can attach a ‘built-in’ 9V battery pack with the main power supply circuitry for implementing an ‘automatic power backup’ feature. So, with the circuit above can provide +5 and +3.3V regulated outputs as VCC source (VCC 1 and VCC 2), and also a stable +2.5V regulated output served as a ‘clean’ reference voltage (VREF) for optional analog circuits linked up with the microcontroller unit.